Tag Archive | "Columbian Shark (Arius jordani)"
The Columbian Shark (Arius jordani) is also known by tropical fish keeping enthusiasts as the Black Fin Shark, Jordan’s Catfish, and the West American Cat Shark. The Columbian Shark is found in fresh and brackish waters from Mexico to Peru. They inhabit tidal lagoons and estuaries throughout their range and can withstand a full marine environment. The Columbian Shark has a high dorsal fin and long whiskers. The body of the Colombian Shark Catfish is elongated and silver in color with a white belly. The fins are black, tipped with white. The Columbian Shark has a broad head with relatively large eyes and mouth. 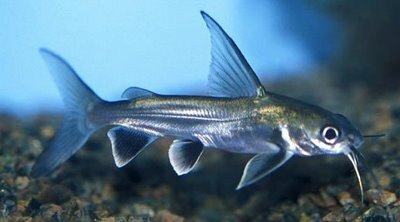 They have three pairs of barbels; two on the lower chin area and one pair on the upper jaw. Juveniles are quite attractive and are constantly moving around the tank but as the mature they slow down and their colors begin to fade. Arius jordani has a venom producing gland at the base of their dorsal spines which can cause careless handlers a great deal of pain. Extreme caution should be exercised when handling these fish. Columbian Sharks are paternal mouthbrooders. The fish spawn in the sea and the very few eggs that are produced are incubated by the males in their mouth. Like Salmon, the males swim into the coastal rivers to deposit the fry in fresh water where they remain during the early stages of their life cycle. As they grow, they slowly migrate back to the coastal areas where they eventually complete their life cycle in the ocean. In an aquarium environment, they require good filtration, an adequate current, plenty of rocks, caves (for hiding), a dark substrate and subdued lighting. Because they grow quite large they need at least a 75 gallon tank to keep them happy. Since the Columbian Shark does best with some aquarium salt added to their tank, aquatic plants should not be included in their aquascape. A 2% salt solution (7.0548 oz of salt to 26 gallons) is recommended for keeping juvenile Columbian Sharks and as they mature, they can be slowly acclimated to a total marine environment. Feeding the Columbian Shark is easy. They eat sinking catfish pellets , algae wafers or pellets, bloodworms and other smaller fish that they can fit into their mouths. Although they are peaceful scavengers, they should not be placed in a community aquarium with smaller fish. Juveniles are offered for sale when they reach 2″ to 4″ in length.